Today we are visiting Bangladesh. I again chose a neighboring country for its strong aroma of Bengali Cuisine. Yes, since Bangladesh borders with West Bengal, they have a strong influence of bengali style in their cooking. Traditionally, the cuisine emphasizes fish, vegetables and lentils served with rice,with rich regional variations caused by different factors, including Bangladesh's history and geography. From this vast cuisine, i chose to make this delectable Golap pitha. What is a pitha? Pitha/Pithe is a type of cake, dimsum or bread common in Bangladesh and India. Pithas are primarily made from a batter of rice flour or wheat flour, which is shaped and optionally filled with sweet or savory ingredients. When filled, the pitha's pouch is called a khol (lit. "container") and the fillings are called pur. For savory pithas, ingredients are usually fried, baked, or steamed, and then mashed, cooled, and formed into small balls to stuff into the pithas. Sweet pithas typically include sugar, jaggery, date juice, or palm syrup, and can be filled with grated coconut, cashews, pistachios, sweetened vegetables, or fruits. Sweet pithas are also often flavored using cardamom or camphor. Depending on the type of pitha being prepared, pithas can be fried in oil or ghee, slow-roasted over a fire, steamed, or baked and rolled over a hot plate. Pithas are often eaten at small meals such as breakfast or as a snack with tea, although there are many sweet varieties that are reserved for desserts or holidays. While some pithas can be made any time of the year in Bengal (Bangladesh and Indian West Bengal), there are special pithas strongly associated with harvest festivals such as Nabanna (nôbanno, literally meaning "new rice" or "new food") and the Poush parbon (the Poush festival). Take milk and salt in a heavy-bottom pan and boil it in a simmer heat. When it starts boiling, add the flour into it and stir well to mix. Take it off the heat and keep it covered. When it is warm enough to touch, smear some ghee in your hands and knead it well to make a smooth and soft dough. Divide the dough into 4 portions. Take Sugar and water in a saucepan, boil it in a slow flame. When the sugar completely dissolves, add cardamom powder and saffron. Let the syrup be simmering until your finish frying your pithas. Dust your rolling surface with little flour, now take one small ball and start rolling it out thin. 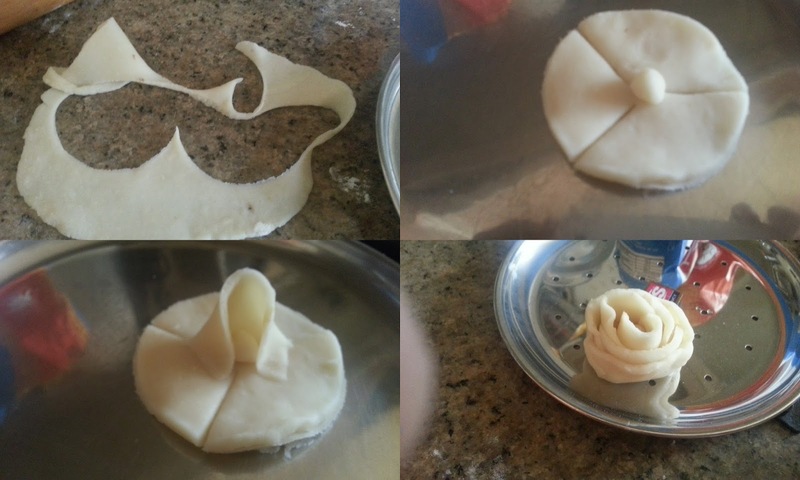 Take a 5-6 cm round cookie cutter or any round shape sharp edge bowl and cut out small rounds of the rolled dough. To Make a Gulap/Golap, take 3 small roti's and stack them together. Make a small ball of dough and place it in the centre of the stack, like a bud. Make 3 slits on the dough stack representing Inverted Y. you will having 3 sets of triangle around the center bud. Now carefully lift a triangle and fold it around the center bud. Again take the second triangle and wrap it around the center bud again, it will partially cover the first petal also. Likewise, keep wrapping each triangle around the center bud, to get a full bloomed rose/gulab. 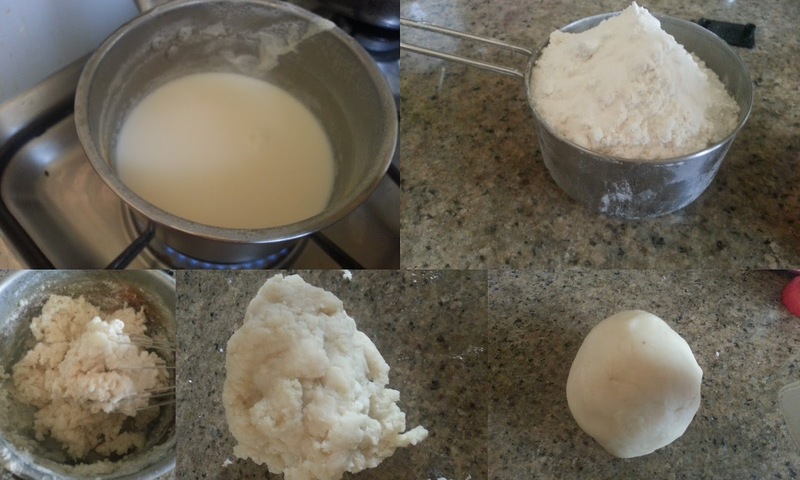 Make 2 or 3 pithas at a time and keep the dough and prepared pitha's covered all the time. In a heavy-bottom pan, heat oil. When it is hot enough, deep-fry the prepared roses/gulabs in medium heat and in batches. Take care and fry them well until they turn golden brown on all sides. Do not hurry while deep frying or else you will end up with uncooked pithas. Drain the pitha's on a kitchen towel to remove any excess oil. Then put them in the sugar syrup which is simmering in the low heat. Flip your pitha in the syrup for couple of time to coat it with sugar syrup. Then take them out on a plate. Remove the process with the rest of the dough. I refrigerated the pitha's and served them next day by slightly reheating it in Microwave for 20 seconds. While serving, drizzle some sugar syrup on top, sprinkle some melon seeds and give a colorful treat to eyes too!!! My God Priya! This so very beautiful n patient work. With baccha company u can do such awesome work . Wow. Love it. Wow! The roses look awesome. What a creative recipe you have chosen. Perfectly done. Pithagolap are very cute and a wonderful choice for the country. Even I did Bangladesh but went with a simple curry. Trust me or not, i picked these gulap pitha for B, then later i changed my mind and went for waffles, you got them prefectly priya. The rose shaped pithas look cute and bet they would be a hit at parties. The roses look stunning, Priya! Awesome work! Lovely choice for the country and excellent job on execution. Wow ,those rose shape pitha are looking outstanding. lovely choice.. Beautifully made Priya nice choice. wow priya your golap pitha have turned out superb :) Love the way you have shaped them :) even I made them yesterday :) fantastic job on shaping them. While every one was raving about these roses..I was wondering. .but my my..must say they look gorgeous. .would love to try them soon..book marking. very delicately shaped dessert... well done ! golap pithas looks cute & tempting.. bookmarking this recipe.